Lark Books (NC), 9781454709190, 128pp. Crocheters in search of sophisticated designs will find what they're looking for in this chic, contemporary collection. Fifteen patterns include sweaters, pullovers, boleros, and other stylish garments, all beginning with simple geometric shapes. 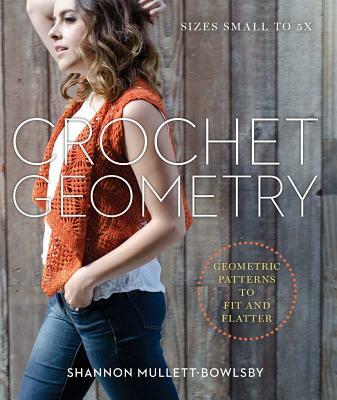 A circle becomes a cardigan, four rectangles turn into a vest, and two triangles transform into a poncho. A superb basics section, with the clear, accessible details that have made Shannon Mullett-Bowlsby a renowned world-class teacher, will help even beginners master the skills needed to create these stunning items. Shannon Mullett-Bowlsby is the co-owner and creative director of Shibaguyz Designz. He is the author of Designer Crochet and has had over 300 patterns published in books and magazines, including Crochet! Magazine, Crochet Today, Inside Crochet, and Knitting Today. He is a member of the Crochet Guild of America, the Knitting Guild of America, the Crochet Liberation Front, and the National Needle Arts Association, and is a Craft Yarn Council Certified Teacher. He lives in Seattle, WA.